LEGO Ideas has announced the winner of the Second 2016 Review Stage and it is the Women of NASA. This set was stated to be releases in late 2017 or early 2018. In addition, the Voltron – Defender of the Universe project is still under consideration so that could also be a set in the future. The results of that will be announced at the Third 2016 Review results. There were twelve projects that qualified for review which included Voltron – Defender of the Universe, Spaceballs – Eagle 5, The Addams Family Mansion, the Merchant’s House, the Large Hadron Collider, LEGO Observatory – Mountain View, Modular Construction Site, the Women of NASA, Star Wars UCS X34 Landspeeder, Lamborghini Veneno Roadster, Lovelace & Babbage, and The Plum Creek – The Little House on the Prairie. 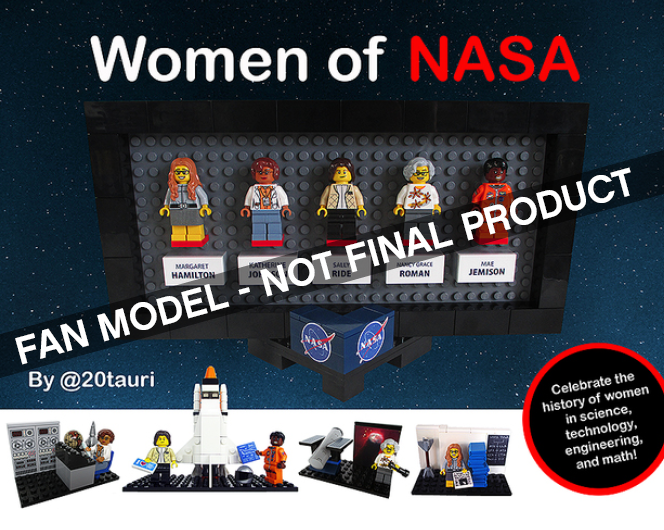 Honestly, the Women of NASA project didn’t really surprise me because LEGO does have a partnership with NASA and there are a few space-themed sets already including the upcoming Saturn V one for later this year. What do you guys think if the project that was chosen to become an official LEGO Ideas set? Sound off in the comments below.